Connor Finlayson scored twice on his debut to help Blackpool to their first win of the season in an entertaining Lancashire derby. Striker Finlayson was one of three changes to the side that drew 0-0 at home to Cleator Moor Celtic on Saturday, with Stephen Betteridge and Conah Bishop also coming into the side. The home team started the stronger, with Yahya Saeed going close early on, but Blackpool then piled on the pressure and forced a succession of corners. Both sides had opportunities before Finlayson curled a 26th-minute shot into the top corner for his first league goal for the club. 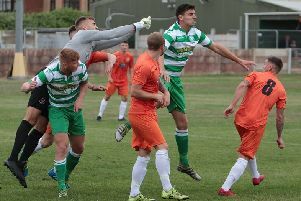 Darwen keeper James Whittingham denied Blackpool a second when he saved from Martin Baird one-on-one . But he could not prevent Finlayson making it 2-0 just two minutes before the break, when he rounded Whittingham for his second in front of the travelling Tin Hut Brigade. Saeed rounded Blackpool keeper Alex Cameron early in the second half but shot into the side-netting. However, he did halve the deficit on 69 minutes by tapping home from close range. But thoughts of an equaliser ended seven minutes later, when Bishop scored what proved the winner with a low shot. Darwen did score again with two minutes remaining, when Martin Parker headed home a right-wing cross, but Blackpool saw out the very nervy last few minutes to climb to fifth in division one north with four points from two Hallmark Security League games. The team’s determination to cling on for the three points was pleasing for the supporters, who celebrated with the players at the end. Eighteen-year-old Finlayson, a product of the Fleetwood Town academy who played for Squires Gate last season, was named man of the match. AFC are at home to Atherton LR on Saturday. 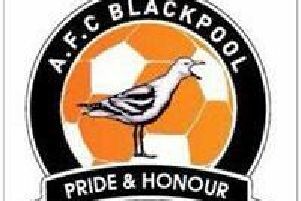 Blackpool: Cameron, Donaghy, Betteridge, Caunce, Taylor, Pickering, Baird, Fishwick, Duffield, Finlayson, Bishop; subs: Dawson, Williams, Nay, Bradley, Mottram.